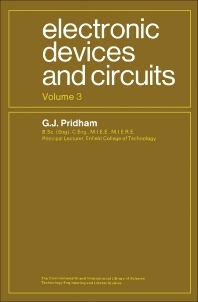 Electronic Devices and Circuits, Volume 3 provides a comprehensive account on electronic devices and circuits and includes introductory network theory and physics. The physics of semiconductor devices is described, along with field effect transistors, small-signal equivalent circuits of bipolar transistors, and integrated circuits. Linear and non-linear circuits as well as logic circuits are also considered. This volume is comprised of 12 chapters and begins with an analysis of the use of Laplace transforms for analysis of filter networks, followed by a discussion on the physical properties of solids. The electronic structure of matter, conductors and insulators, and intrinsic and extrinsic semiconductors are examined. Subsequent chapters deal with the physics of semiconductor devices, together with field effect transistors; small-signal equivalent circuits of bipolar transistors; integrated circuits; linear and non-linear circuits; logic circuits; and electron ballistics (VHF valves). This book is written for aspiring professional and technician engineers in the electronics industry.